This is the next oldest imaging modality after radiography; it was in widespread use by the late 1890s. The earliest fluoroscopy units required the Radiologist to stand in the path of the xray beam, on the opposite side of the patient from the xray tube, directly observing the image produced on a fluorescent plate. This, of course, was before people realized that xrays were in any way dangerous. Nowadays our fluoroscopy units comprise an xray tube, a table for the patient, and an image intensifier which can translate a very low dose of xrays into a real-time image on a TV screen. The operator can stand well out of the way, safely protected by lead shields and lead aprons. The fluoro room at SVUH. Fluoroscopy procedures almost always involve the use of contrast media – barium for most enteral studies and iodinated contrast for everything else. 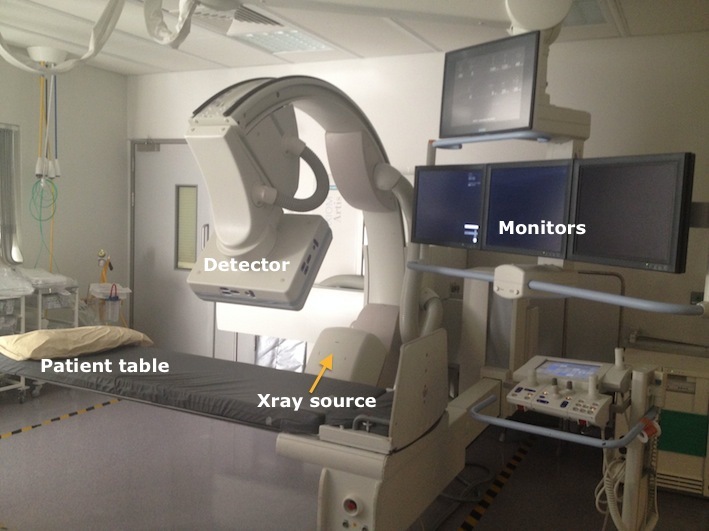 Fluoroscopy is used in several rooms in the department: the ‘fluoroscopy room’, obviously enough, but also in the two IR suites and portably in the Operating Theatres for vascular procedures, such as EVAR, that Radiologists perform there. 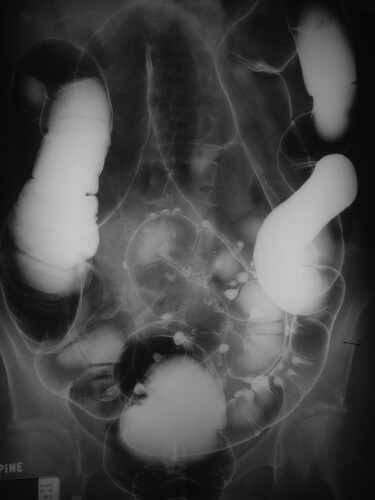 This is an image from a double contrast barium enema, showing sigmoid diverticular disease. Historically one of the busiest rooms in the Radiology department, things have slowed down considerably in this room in the last decade or so. This is mainly because endoscopy has taken over the role of barium meals for evaluation of gastric tumours and ulcers, CT and MR enterography have taken over from small bowel enemas, and CT colonography has rendered barium enema examinations obsolete. However, we continue to perform a large number of barium swallows, as these studies provide a functional assessment of the oesophagus that can be very useful, and can also demonstrate gastro-oesophageal reflux. Video swallow assessment is frequently performed in co-operation with the speech and language therapy department for patients who are at risk for aspiration due to a dysfunctional swallow, for example following a stroke. This is a coned image from a contrast enema showing an ‘apple-core’ lesion (arrow), characteristic of colon cancer. 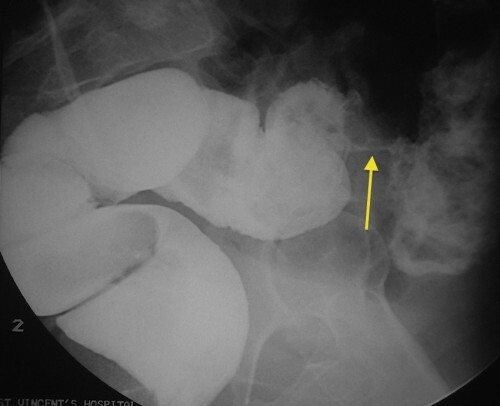 Barium small bowel follow-throughs remain useful in the evaluation of patients with suspected or known Crohn disease. The fluoroscopy room is also used for therapeutic injection (with corticosteroid) of joints in patients with osteoarthritis or inflammatory arthritis, and for nerve root blocks for patients with radiculopathy due to lumbar spine degenerative disease. 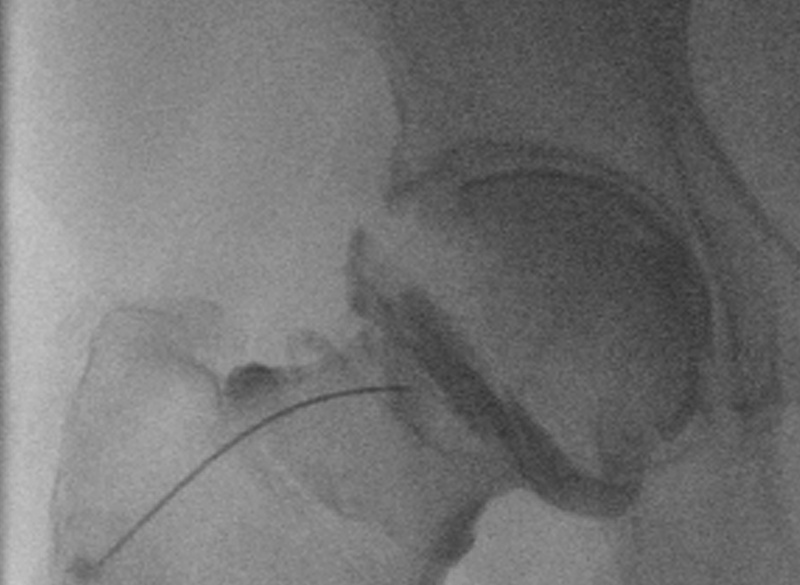 A needle can be guided into the correct position, for example into the hip, using fluoroscopic guidance. Injection of iodinated contrast will then confirm that the needle tip is in the joint, following which the therapeutic injection is performed. Image from a fluoroscopy-guided hip injection; iodinated contrast has been injected into the joint through a spinal needle.